When natural gas drilling first boomed in Garfield County, controversial processes like hydraulic fracturing, or fracking, were hardly household words. Since then, gas drilling has spread across the country to more populous states like New York and Pennsylvania, and the industry has gotten a lot more scrutiny. 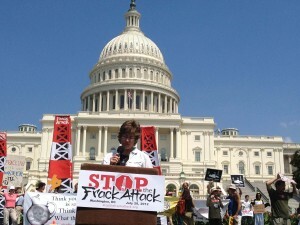 On Saturday (7/28/2012,) environmentalists organized their first –ever anti-fracking march in Washington. A delegation from western Colorado was there to join the protest, and to share their stories. It was 2001 when Laura Amos became concerned gas drilling near her home south of Silt was making her sick. Amos developed a rare adrenal tumor, and tests showed her well water was contaminated with chemicals. The gas company supplied her family with drinking water and eventually bought her house. Amos signed a confidentiality agreement that forbids her from talking about her story, but it hasn’t stopped her from complaining about the gas industry in general, or from appearing in front of a thousand protesters at the nation’s capitol. 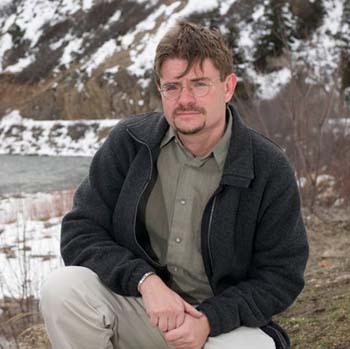 When Amos first tangled with the gas industry, drilling often occurred in remote places, like western Colorado, and it affected landowners one by one. Since then, drilling in the East Coast’s Marcellus Shale has affected more populous states like New York and Pennsylvania, and natural gas drilling has gotten a lot more attention. So have some of its more controversial processes, like hydraulic fracturing, or “fracking,” in which chemicals are injected underground to break up the rock and make it easier to remove the natural gas. The industry says fracking is safe and has never poisoned groundwater or well water. Critics say it should be more tightly regulated. On Saturday, protesters came for the first-ever national anti-fracking protest. They gathered on the west lawn of the Capitol, then marched to the Washington headquarters of the American Petroleum Institute and the American Natural Gas Association, where they placed milk jugs of dirty water they say was contaminated by drilling. Josh Fox, director of the controversial documentary “Gasland,” was among them and said, “You’ve got people in this rally from Wyoming, from Arkansas, from Colorado, from Texas, from Australia, from Europe, obviously from New York, Pennsylvania, Maryland. It is a conscious that’s dawning that this is eating up huge sections of the United states and making them unlivable. That’s a contamination of the American Dream. The protesters are asking Congress to pass two pieces of legislation. The Frack Act, sponsored by Colorado Democrat Diana DeGette, would force fracking to abide by standards in the Clean Water Act. And the BREATHE Act, sponsored by Colorado Democrat Jared Polis, would apply Clean Air Act standards to fracking. The gas industry says fracking doesn’t harm air or water. While the process of hydraulic fracturing is getting all the attention recently, many of the protesters’ concerns were about the gas industry in general rather than fracking in particular. For many, the word “fracking” has become shorthand for gas drilling. Gas activist Tara Meixsell traveled from New Castle to attend the rally. What is clear is that gas drilling is getting a lot more attention these days, and if the volume of these protesters is any indication, that isn’t going to change any time soon.